This is the classic ebook that continues to be a bestseller today. 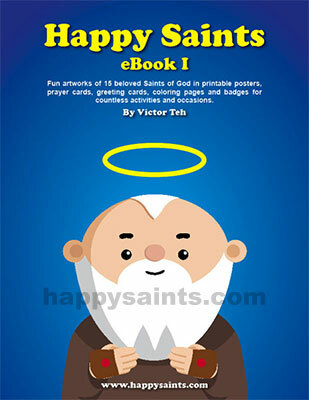 Featuring 15 popular Catholic saints in ready-to-print illustrations, it is widely used in parishes, classrooms and homes throughout the world. For non-commercial use only. Each saint is presented in ready-to-print posters, prayer cards, greeting cards, coloring pages and badges. Hi! I bought this book a while back and now my computer tells me that it is a damaged file and I can no longer use it. Any suggestions on what I can do? Any help would be appreciated. I absolutely loved this book!